Living in England as I do, you don't come across many Dragon Blood Trees - none in fact. So my one and only introduction to them was by way of the above clip shown on David Attenborough's 2009 series 'Life'. However, whilst visiting Valencia recently, I found myself wandering around the Jardines del Real Zoo, looking for - amongst other things - a toilet, an ice-cream and the exit. It was on my way towards what looked to be a way out that I came across this suspicious looking Yucca. I say 'suspicious looking' because while it was distinctly Yucca-like in the canopy, the uppermost stems uncannily resembled fat ladies arms - something that I hadn't noticed before in more familiar Yucca species. However, these fleshy stems are a clue, as they are indicative of a plant that has evolved in an arid environment - and no, there was no identification label. This brings me back to the present day when by chance I was watching a repeat of David Attenborough's 'Life' programme. Lo and behold, Sir David was describing the merits of the fantastic Dragons Blood tree, and unless I am mistaken this is the very same tree that I photographed in the Jardines del Real Zoo. Granted, the specimen I happened across displayed a more open habit, but this is likely to be due to the more clement Spanish weather. What is a Dragon Blood tree? 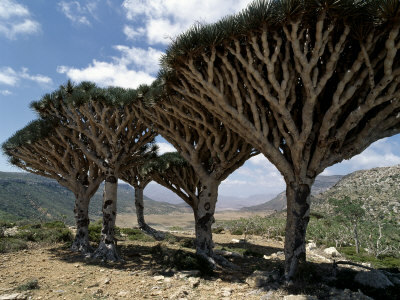 Dragon's blood trees are a distinctive and slow-growing species from the genus Dracaena which is native to the Socotra archipelago off the horn of Africa, and is arguably its most famous and distinctive plant. It has a unique and strange appearance, described as 'upturned, densely-packed crown having the shape of an upside-down umbrella'. Not heard of Socotra Island? Well neither had I. The name Socotra is derived from a Sanskrit name meaning 'The Island of Bliss'. The Dragon Blood tree received its colourful name from the famous red resin that is exuded from the bark after wounding. 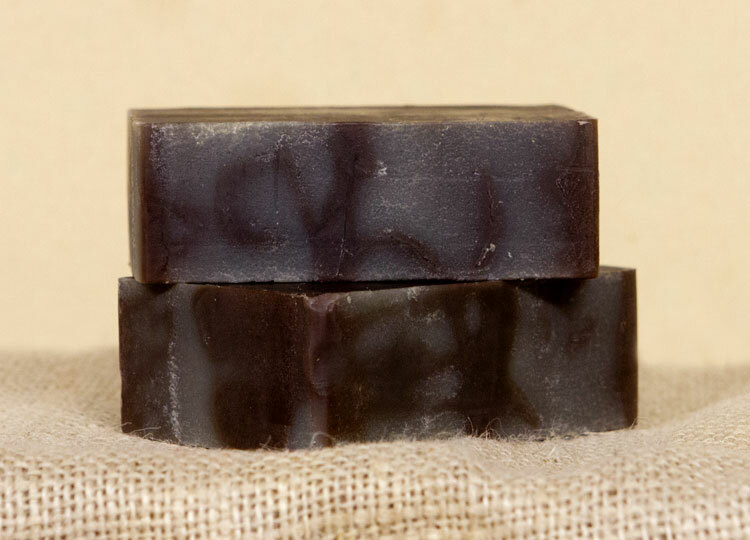 The medicinal and colouring properties of this resin, and that from other dragon trees, was recorded by the ancient civilisations of Greece and Rome. In fact, it continues to be used in medicine, dyes, varnish and incense to this day. The unusual shape of the dragon's blood tree is an adaptation for survival in arid conditions with low amounts of soil, such as in mountaintops. The large, packed crown provides shade and reduces evaporation. This shade also aids in the survival of seedlings growing beneath the adult tree, explaining why the trees tend to grow closer together. Although most of its ecological habitats are still intact on the Socotra Archipelago, there is an increasing population with industrial and tourism development. While the dragon’s blood trees range is widespread, it has become fragmented due to this on-going development within its habitat. Unfortunately, many Dragon Blood tree populations are suffering due to poor regeneration. Furthermore, human activities have greatly reduced the dragon blood tree numbers through overgrazing, and feeding the flowers and fruits to the livestock of the island. 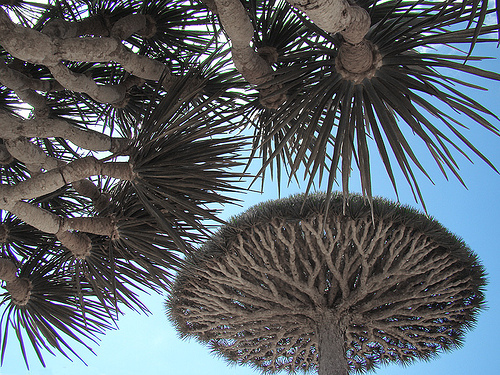 Additional threats to the dragon's blood tree include harvesting of its resin and use of the leaves to make rope. However, perhaps the species' greatest threats is the gradual drying out of the Socotra Archipelago, a process which has been an ongoing for the last few hundred years. This increasing arid environment is predicted to cause a 45 percent reduction in the available habitat for 'Dracaena cinnabari' by the year 2080. With that in mind, perhaps the Spanish could make a point of growing a few more specimens in their public gardens - just as a precaution.